Post Tagged with: "villa group review"
When looking to buy a timeshare, it is only natural to want to hear from others who have taken the plunge, so to speak. So, before giving you all the information we can about Puerto Vallarta timeshare at Villa del Palmar, I thought you’d like to hear from a happy customer! “I bought a Puerto Vallarta timeshare at Villa del Palmar over a decade ago, and it was really one of the best choices I made. We go to the timeshare ever year for around ten days. I bought a Villa Preferred Access membership, so, though I bought the equivalent of a Deluxe Studio for two weeks, I bank the unused points (for the four days) so that we can afford to bring our kids or some friends every three years or so. I love that the system is flexible enough to allow this! I also love the resort itself in Puerto Vallarta; the location is wonderfully central and is right opposite a shopping mall, which has a large supermarket. The beachfront is a safe area, and we’re only ten minutes from the downtown area, though taxis are cheap and the buses pass regularly the walk is pleasant. The Villa del Palmar Puerto Vallarta resort and Villa del Mar were the first timeshares complexes to be opened by the Villa Group when they began operating in 1983, so it really is the original Mexican getaway. The experience is “old-school Mexico timeshare:” self-catering options, kitchen facilities in all suites, large pools and jacuzzis, the resorts facilities are kept up to date. In fact the resort recently enjoyed a rejuvenating face-lift which involved a refurbishment of suites, a new entrance lobby, more parking and renovations to the main and seafront pools. As Martin notes, the points system is very flexible and allows you to modify your vacations to suit your needs, but what he doesn’t note is that you can use your points to purchase little extras. These include spa treatments, all-inclusive meal plans, a butler service, or even the use of a private chef for a night, should you be entertaining. 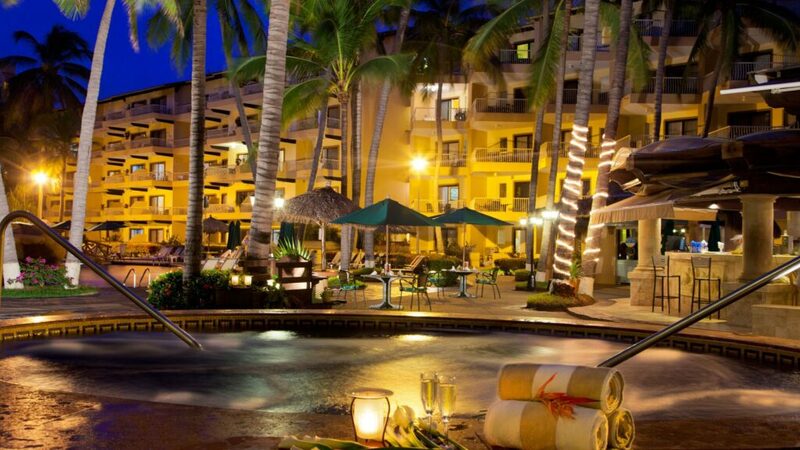 Puerto Vallarta timeshare at Villa del Palmar is a great option.